This review of Sky Atlas 2000.0 is the second in a series of atlas reviews to help you decide which star atlas is right for you. 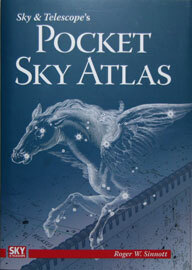 My first review covered S&T’s Pocket Sky Atlas. Sky Atlas 2000.0 is a large-scale atlas beautifully printed in a large-page format. It has stars down to magnitude 8.5 and deep sky objects down to around magnitude 13. 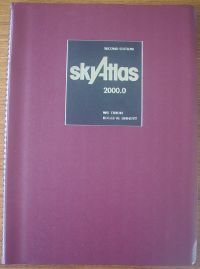 Sky Atlas 2000.0 comes in three editions: Desk (black stars on white background), Field (white stars on black background), and Deluxe (color-coded deep-sky objects on white background), and each edition comes in a paper version and a laminated version. All versions include close-up charts of crowded areas such as the Virgo cluster, as well as a transparent plastic coordinate-grid overlay for determining positions accurately.